Founded in the late 11th – early 12th century, the cathedral school was annexed to the episcopal residence, and originally educated boys to join the clergy. After the Reformation of 1536, it continued as a grammar school for boys. It was located in the centre of the town of Viborg, from 1772 at No. 1 Sankt Mogensgade, where its original gardens, known as the Latin Gardens", still exist. Viborg Cathedral School was a boys' school until 1903 when girls were admitted to the sixth form. 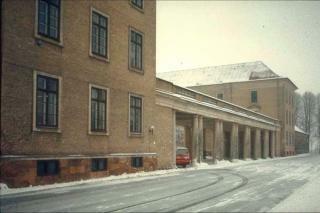 In 1926, Viborg Cathedral School moved to its present, listed premises. With its imposing facade, the building signals that the school educates pupils for the realm of knowledge. " Film director Niels Malmros referred to Viborg Cathedral School as the finest school building in Denmark, when he used it as the setting for his 2009 film Kærestesorger. Certainly, the school impresses the observer with its air of self-possessed majesty. In this French-inspired three-winged building in the Neo-Classicist style, harmony is prized with the many straight lines, symmetries and the verdigris dome with its observatory atop the main building. The architect, Hack Kampmann (1856-1920), was one of the most notable of his time. He designed a large number of important buildings, including the police headquarters in Copenhagen, Aarhus Theatre and Randers state school, distinctive aspects of which were inspired by Viborg Cathedral School.